Today’s blog comes from AmeriCorps Alums Co-Executive Directors, Ben Duda and Mary Bruce. It’s been a big, big year. If we invited everyone who supported AmeriCorps Alums to a holiday party, we’d run out of cocktail meatballs in the first ten minutes. This was our best year yet for inspiring champions, partners, and each other. Nowhere was that more evident than the 20th anniversary of AmeriCorps. Across the nation, Corps members, alums, national service partners, Lou Diamond Philips (yes! Lou!) and four U.S. presidents paid tribute to service. Together we celebrated with nearly 200 state commissions, nonprofit partners, and AmeriCorps Alums chapters. We also honored 20 AmeriCorps alums with National Leadership Awards. Then, when you thought it couldn’t get any better, President Obama announced Employers of National Service. We’re proud to be a primary partner on this initiative to support careers of AmeriCorps and Peace Corps alumni. We’ve continued connecting you to the opportunities that support our life after service. Thousands of you joined us for graduate school fairs, career fairs, conferences, guest blogs, and more. We were on-stage with Chelsea Clinton at the Franklin Project’s Summit at Gettysburg, and then joined hundreds of alums at the Conference on Volunteering & Service to highlight our untapped potential to serve and lead. 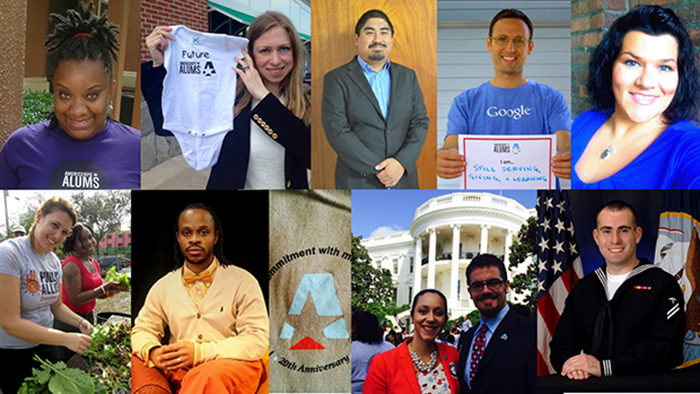 Who better to talk about the future of service than AmeriCorps alums? You can’t beat that AmeriCorps moment and that instant connection you feel when someone says, “I served too.” Our most popular alum guest blog of 2014 from Youth Build alum Jamiel L. Alexander says its best: “Money Can’t Buy What Service Pays Forward.” Community. Legacy. A lifelong mission. Keep building that legacy today. Here are four ways we can grow stronger together in 2015. Connect us to your friends who served. We’re launching a new Facebook app to grow our community. Join the app and you’ll be able to connect us with your friends who served. Share the alum talent pipeline with your employers, colleagues, and friends. Use our new infographic highlighting the skills alums bring to their careers to support all alums in their next step after AmeriCorps. Start a conversation. Click here to finish this tweet and tell us about the best Alums 2014 moment for you! Keep in touch all year-round on our blog, Facebook, Twitter, and LinkedIn. Help grow AmeriCorps Alums by making a $25 tax-deductible contribution before 12/31. Your gift will help us grow our professional development offerings in 2015. Any gift of $25 gets you a #MadeInAmeriCorps Travel Mug! Give $25 and give us a head start supporting alums in 2015. Love hearing good news from AmeriCorps Alums? Register with us to get the latest news and resources first!